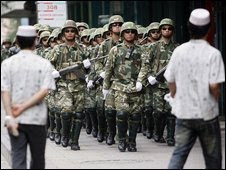 Security forces in the Chinese province of Xinjiang have said they will "strike hard" against crime and disorder. Officials vowed to "root out" crime and and "change the face of the public security" in the western province, after deadly unrest earlier this year. Nearly 200 people died in July's rioting between ethnic Uighurs and members of the majority Han group. A total of 21 people have been found guilty of involvement in the unrest and 12 people have been sentenced to death. The Xinjiang authorities, quoted in state media, said the "strike hard and rectify" campaign would run until the end of the year to "further consolidate the fruits of maintaining stability and eliminate security dangers". They said they would "root out places where criminals breed, and change the face of the public security situation in these areas". The Xinhua news agency said local police would continue to hunt down suspects in the riots and "keep a close eye on clues and cases involving terrorism and explosions". The violence in Xinjiang erupted on 5 July, when protest by ethnic Uighurs left at least 197 people dead and another 1,700 injured. Two days later, groups of Han went looking for revenge as police struggled to restore order. Most of those killed were Han, according to officials, and Urumqi's Han population had demanded swift justice. Last week, the death sentences against 12 people were upheld by an appeals court. China says it is facing a separatist uprising from Uighur Muslims in Xinjiang, but critics say Beijing is exaggerating the threat to justify its tight control of the province.